After being semi-retired for a period (although it's rumored she appeared with Joan at Newport, 1966), Mimi toured regularly, first with Carol McComb (late of Kathy & Carol) in the late 60s, early 70s. In 1970, she wrote and recorded a song for the film Fools, but this was to be her only soundtrack work, and her last solo recording for almost 15 years. 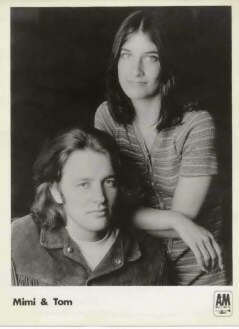 In 1971, she recorded a well-received album with singer/songwriter Tom Jans for A&M Records, self-penning four and co-writing three songs; the duo toured but plans for a second album never materialized. 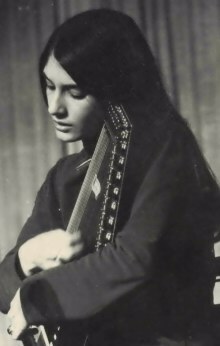 Her recording career was put on hold in 1974 when she founded and became executive director of Bread and Roses, a nonprofit, charitable organization dedicated to bringing live music, according to one of their fund-raising albums, "to people in limited environments ... Hospitals, mental health facilities, convalescent homes for the aged, and prisons; all house people who desperately need the joy, diversion, and positive human contact that live entertainment can provide." Mimi and her sister Joan occasionally performed for Bread and Roses as the Kitchen Sisters, performing in cheesy blond wigs. 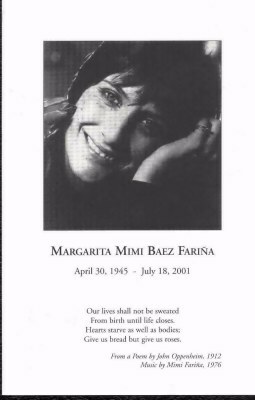 In 1981, Mimi submitted a five song cassette to the Library of Congress for copyrighting, featuring songs co-authored by Mimi and Banana Levinger ("Big Party", "Mister Rudy") David Amram ("Dandy Lion"), Gary Goodrow ("Of Love") and Bill Amatneek ("Feeling Left Behind"), of which, only "Big Party" was ever rerecorded and released commercially. 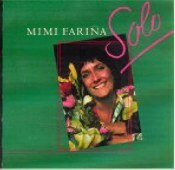 In 1986, she returned to the recording studio for Rounder Records' subsidiary Philo Records, releasing Solo. 1973 - Where Are You Now, My Son? 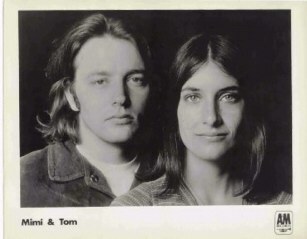 - A&M Records / SP-4390 - (guitar and vocals here and there for her sister Joan's album). 1979 - Bread and Roses : Festival of Acoustic Music - Greek Theater, U.C. 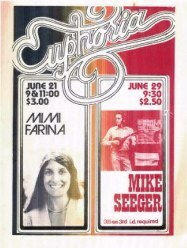 Berkeley - Fantasy Records / F-79009 (although Mimi didn't bill herself as a performer on this LP, she conceived it, organized it, got a huge number of her friends to contribute their time and music, as well as headed Bread & Roses. The LP features Malvina Reynolds, Maria Muldaur, Dan Hicks, Buffy Sainte-Marie, Country Joe McDonald, Joan Baez, John Herald, Pete Seeger, Richie Havens, the Persuasions, Jesse Colin Young, Dave Van Ronk, Hoyt Axton, Arlo Guthrie, Toni Brown & Terry Garthwaite (aka: Joy of Cooking), Boys of the Lough, Mickey Newbury, Tom Paxton, Jackson Browne and Ramblin' Jack Elliott - a double album, the inner fold is filled with photos of a delighted and grinning Mimi.